Trace fossils (otherwise known as ichnofossils) are an echo of ancient life, providing evidence of animal activity in the past. Unlike normal fossils, which reveal the body of an animal in death, trace fossils show us how an animal behaved in life. Trace fossils can take many forms, including fossilized animal burrows, footprints, tracks, trails, nests, eggs and, of course, fossilized poop. Visiting them can offer a chance to learn more about the insights scientists have made from these amazing finds. Footprints are perhaps the most evocative of trace fossils, allowing us to literally walk in our ancestors’ shoes. Some are transitory, like the ones found in 2013 in Norfolk, England, where a team of researchers from the British Museum noticed that heavy seas had washed away layers of silt, leaving the uncovered estuary mud pock-marked with ancient footprints. Unfortunately, the 800,000-year-old prints eroded in a matter of weeks, but their existence was well-documented in digital images and will continue to be studied. Other footprints have lasted far longer: One pair recently discovered in British Columbia may be 13,200 years old, which would make them the oldest found in North America. Where to see them: The most famous site containing footprint trace fossils is the Laetoli trackway in Tanzania. Footprints of early hominins from 3.6 million years ago were uncovered here, proving that our early ancestors walked upright. Visitors hoping to see the actual trackway will be disappointed, since it’s not open to visitors, but a cast of the footprints can be seen at the nearby Olduvai Gorge Visitor Centre. Some of the most intriguing trace fossils are trackways left preserved in sediment. Because the tracks are not generally found alongside the fossil of an actual animal, it can be very difficult for scientists to uncover the type of creature that made the trackway. In some cases, such as soft-bodied worms—which would not leave bodily evidence in the fossil record since they have no skeleton—trace fossils of their castings are the only evidence for their existence. Because fossilized trackways are created where the creature lived and moved, they can often help researchers to discover more about an animal's habitat and behavior. Where to see them: A great example of a fossilized trackway can be found in the Smithsonian National Museum of Natural History in Washington D. C. Here, visitors can see an eight-foot tall cast of trackways made by Climactichnites, a two-foot long slug-like creature. Asteriacites, the fossilized remains of starfish or ophiuroid burrows, are some of the most beautiful trace fossils. Most common in Jurassic rock formations, the indentations are created by the starfish digging their arms into the soft sediment. They are especially useful for scientists, since these trace fossils can leave an impression of the animal’s actual body. Other common resting traces are left by trilobites. Burrow trace fossils, on the other hand, are most frequently associated with small burrowing sea creatures or bivalves, such as clams. Where to see them: An Asteriacite fossil can be seen at the Peabody Museum of Natural History at Yale University in Connecticut, where they have a world-renowned Invertebrate Zoology department. Bitemarks in the fossil record can point to beavers building their dams, insects nibbling a leaf, or—in some rather more gruesome cases—dinosaurs gnawing their fellow dinosaurs. Unfortunately, it can be very difficult to identify which animal was eating the victim by toothmarks alone, but occasionally identification is made possible when part of a tooth has been left embedded in the bone. For example, a fossilized pterosaur bone was found in Alberta, Canada, with gnaw marks on it and a partial tooth embedded in it; analysis later indicated it was from the Saurornitholestes, a Late Cretaceous dinosaur similar to the more famous (thanks to Jurrasic Park) Velociraptor. Where to see them: At the La Brea Tar Pits in Los Angeles, visitors can see some amazingly well-preserved Ice Age fossils, with some revealing gnaw marks left by insects and rodents. 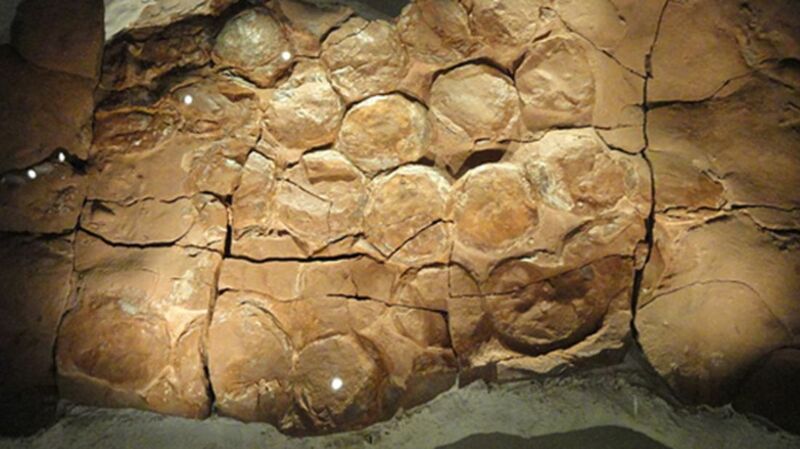 There is some dispute over whether eggs can be classified as trace fossils or body fossils. Certainly where there is embryonic matter preserved inside the egg, they are seen as body fossils. However, fossils of nests can reveal much about the behavior of a dinosaur or other animal, by revealing where they chose to nest. Dinosaur nests have only ever been found on the ground, suggesting that they nested like modern reptiles and birds such as penguins. Where to see them: The Natural History Museum in London has the nest of a Protoceratops, a small horned dinosaur, on display. The nest and a clutch of eggs were uncovered in the Gobi desert in Mongolia and are over 80 million years old. An animal’s fossilized poop (or coprolite) can reveal a lot about their diet, including whether they were an herbivore or a carnivore. For example, Tyrannosaurus rex coprolites indicate that they did not pick at their food, but devoured everything, bones and all. Geologist William Buckland was the first to identify the strange “fossil fir cones” as feces, and coined the name coprolites in 1829. In 2014 a private collector paid $10,370 for a 40-inch long coprolite. Unfortunately, many paleontologists think it may have been wrongly identified, and is merely a blobby mass of the mineral siderite. Where to see them: The world’s largest collection of coprolites can be seen at the South Florida Museum in Bradenton. Dubbed the “poozeum,” the amazing collection boasts 1277 coprolites, found across eight countries and 15 states.